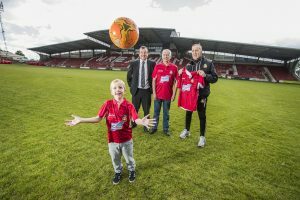 Brave Harvey, 6, unveils new Wrexham AFC kit | News by Wales Express News, People Before Profit! 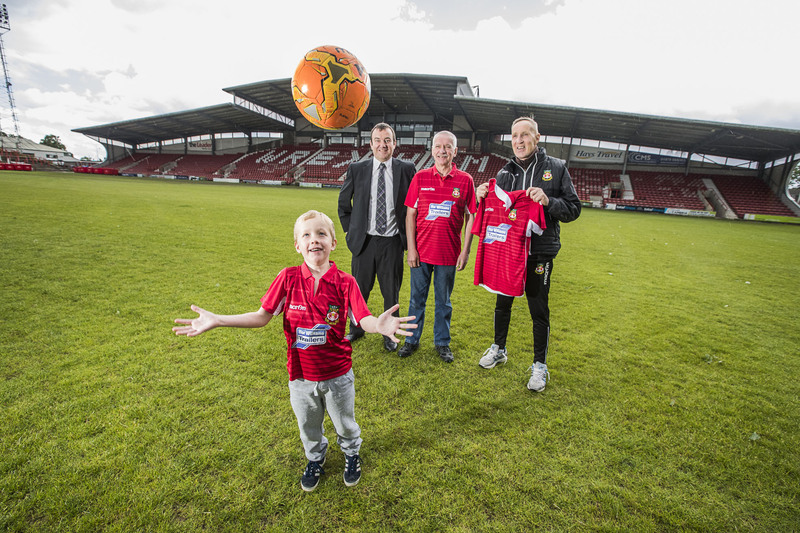 A brave little boy battling leukaemia was “chuffed to bits” to be chosen to unveil the new Wrexham AFC kit. Six year old Harvey Jones is the grandson of lifelong Wrexham fan Llion Jones who works for Ifor Williams Trailers who are sponsoring the club for the second year in succession. The duo were presented with the new shirts by club legend Joey Jones who now manages the youth team after a long and distinguished career with Wrexham, Liverpool and Huddersfield. Once again the distinctive Ifor Williams Trailers logo is on the front of the home and away shirts. According to the club, the partnership was a perfect fit because of the iconic trailer firm’s community spirit which matched their own ethos as a club that’s owned and run by the fans. The company, which has factories in Cynwyd, Corwen and Deeside, has a global network of distributors as far afield as Australia and New Zealand. The new kit will be going on sale for the first time at a family fun event at the Racecourse at 4pm on Friday, June 16. Stars of the show will be rock star Mike Peters and his wife, Jules, who are both fighting their own cancer battles. The event will mark the end of the second day of the Alarm frontman’s 130-mile By Your Side Walk from Flint to the summit of Snowdon. They are raising money for the NHS charity Awyr Las (Blue Sky) as a way of thanking the dedicated staff who continue to provide treatment and care for them in North Wales. Wrexham and Liverpool fan Harvey, who lives in Cynwyd, near Corwen, has been treated for leukaemia since the condition was diagnosed 18 months ago. Grandad Llion, a shift leader at Ifor Williams Trailers, has worked for the firm for 42 years – but has supported the club even longer. He first remembers attending matches with his father at the Racecourse back in 1961. Young Harvey is following in the family tradition and is a member of the Young Dragons’ supporters club. Llion, 62, said: “I am delighted that Ifor Williams Trailers are sponsoring Wrexham again this year because I’ve been a Wrexham supporter since I was the same age as Harvey. “He just loves football and his dad, Alun, brings him here often on a Saturday and then if he doesn’t Harvey comes with me. “He was a mascot for the Braintree game last season and he really enjoyed it – it was one of the best days he’s had in a long time and he’s chuffed to bits to have been chosen to unveil the new kit. “At the moment he’s getting treated for leukaemia and he’s getting better every day. “He has got another 12 months of treatment to go but he’s never complained and he’s never let it get him down. Joey Jones, 62, who had three spells as a player with Wrexham, won two European Cups with Liverpool and 72 caps for Wales, says the Racecourse is his “spiritual home”. He said: “I’ve still got the same feelings for the club now as I had when I first got here as a 15 year old and lodged with Mickey Thomas. The club’s commercial manager, Geoff Scott, was equally delighted to have Ifor Williams Trailers back on board. He said: “It’s fantastic news because it’s an iconic brand that’s known all over the world. “As a club, we do a great deal in the community and I know Ifor Williams Trailers have the same ethos so it’s a good fit. Richard Hughes, the Human Resources Manager Ifor Williams Trailers, said: “Wrexham AFC isn’t a money no object premier league club owned by a mega-rich oligarch or American business tycoons, it is fan-owned and community-focused and that’s why we are involved. “We have many die-hard Wrexham AFC fans among our staff at Ifor Williams trailers, including season ticket holders and Wrexham Supporters’ Trust members. “Most people in North Wales, even those supporting the football giants like Liverpool, Everton, Manchester United and Manchester City, have a corner of their heart reserved for Wrexham AFC. “Football is about health, and teamwork and pride in sporting achievement, and that’s why it’s really important that we have a professional football club in North Wales.